2006 Edgar Award nominee as Best Critical/Biographical book of the year! Kenneth Turan, Los Angeles Times: "A treasure beyond price for fans of both the classic Hammett novel and the three (that's right, three) film versions of the doomed quest for a black bird. An incredible amalgam of photos, memos, letters, reviews, whatever, this will make fans of the book or the film gasp as one unexpected delight succeeds another. With this book, wonders really do never cease." Michael Rogers, Library Journal: (Starred review) "This one-stop resource is a … dream. Highly recommended." Tom Nolan, Los Angeles Times: "Amply and inventively illustrated, [it] holds a wealth of source material. There are too many other highlights in this marvelous reference work to list, let alone describe. [The novel and films are] superbly documented and appreciated by this unsurpassed reference tribute." Dashiell Hammett's novel The Maltese Falcon is often named as one of the best twentieth-century novels. John Huston's film adaptation is one of the earliest examples of film noir. It made Humphrey Bogart a star, and was selected by the American Film Institute as one of the 100 greatest movies of all time. 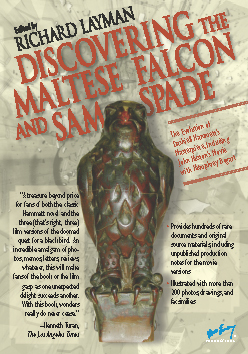 Now, Discovering The Maltese Falcon and Sam Spade uncovers from institutional and private archives a wealth of treasures about Hammett's masterpiece, his detective Sam Spade, the three film versions of the novel, stage adaptations, Sam Spade short stories, radio presentations, and even comics. Many of the discoveries here are previously unpublished. The book provides hundreds of rare documents and original source materials, including production notes for the three movie versions. Contributors include Dashiell Hammett himself, plus Jo Hammett, Richard Layman, Mary Astor, Joseph Shaw, Dorothy Parker, John Huston, Hal Wallis, Darryl F. Zanuck, Joe Gores, William F. Nolan, and more than fifty additional writers. It is illustrated with more than 200 photos, illustrations, and facsimiles. The book is a joy for fans of Hammett, Sam Spade, detective fiction, film noir, and the history of literature and cinema. Richard Layman is the author of several books on Dashiell Hammett, including American Masterpieces: The Maltese Falcon, Dashiell Hammett: A Descriptive Bibliography, and Shadow Man: The Life of Dashiell Hammett. He was nominated for an Edgar Award by the Mystery Writers of America for editing Selected Letters of Dashiell Hammett, 1921-1960. He is also vice president of the publishing company Bruccoli Clark Layman Inc., which produces reference works in literary and social history, including the Dictionary of Literary Biography. He lives in Columbia, South Carolina. Click here for complete table of contents. Discovering The Maltese Falcon and Sam Spade is the second title in The Ace Performer Collection, a new series of books by and about Dashiell Hammett, crowned "the ace performer" by his disciple Raymond Chandler. Oversized 7 x 10 paperback. More than 250 black & white and color photographs and illustrations; 376 pages. Edited by Richard Layman. Publication date September 7, 2005, $19.95, ISBN 0-9725898-6-4. You can order Discovering The Maltese Falcon and Sam Spade from your local mystery bookstore, your local independent bookstore, and all major bookstores and online booksellers.